A WATERFORD Facebook member, caught out by numerous hacks in the past, refrained from clicking on a link that promised he could ‘see who was actually looking at his profile’ today. Ciaran McMahon (25) who recently finished a course in psychology in WIT, found himself making the tough decision ‘not to click’ on the alluring link after he was supposedly tagged in a picture he didn’t recognise. Mr McMahon set up his Facebook account three years ago and has since been caught out 14 times by similar cons. “There was no way in the world I’d click on it. Not this time. Although, I must admit it was tempting. I mean, the thumbnail picture was of a hot girl with her cleavage showing. I really wanted to click it. It said that: WOW YOU CAN NOW SEE WHO VIEWS YOUR PROFILE AND WHO IS VIEWING IT RIGHT THIS SECOND. But then I remembered I don’t have any hot female friends and also the text was something similar to a hack I clicked on before.” he said. The link information also claimed that it would give the user an update every hour to tell them who was viewing the profile. Yesterday, several of his friends clicked the link which then spread from one account to the next. “I remember posting several comments warning people to stay away from the link. It’s an obvious hack. 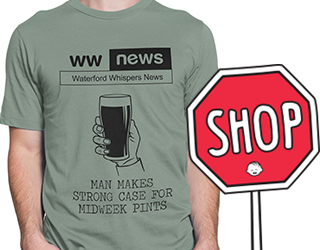 How can they be so stupid?” he told Waterford Whispers News. From the flurry of status updates that are appearing on Facebook, it seems many users are still falling for the phony service. Facebook novice, and father-of-four, Charlie Keane admitted earlier today that he was one of the many friends of Mr. McMahon who got caught out by the scam. Mr. Keane later said he would never use the social network site again. Internet expert Mohamed Patel has asked users to beware of such links and tags.